6) L. Ma, Y. -D. Zhang, J. -W. Pan, and X. -B. Wang, The General Exponential Quadratic Multi-mode Squeezed States, Modern Physics Letters A 10, 837 (1995). 7) Y. -D. Zhang, J. -W. Pan, and H. Rauch, Some Studies about Quantum Zeno Effect, Annals of the New York Academy of Sciences, 755, 353 (1995). 8) Y. -D. Zhang, L. Ma, X. B. Wang, and J. - W. Pan, Two Applications of Linear Quantum Tranformation Theory in Multi-Mode Fock Space, Communications in Theoretical Physics 26, 203 (1996). 9) J. -W. Pan, Y. -D. Zhang, X. -B. Wang, and L. Ma, Some Addenda about the General Formula of Normal Product Calculation for Boson Exponential Quadratic Operators, Communications in Theoretical Physics 26, 479 (1996). 10) X. -B. Wang, Y. -D. Zhang, and J. -W. Pan, General Approach to Antinormally Ordering Boson Exponential Quadratic Operators And Its Applications, Chinese Physics Letters 13, 401 (1996). 11) D. Bruss, A. Ekert, S. F. Huelga, J. -W. Pan, and A. Zeilinger, Quantum Computating with Controlled-NOT and Few Qubits, Philosophical Transactions of the Royal Society A 355, 2259 (1997). 12) J. -W. Pan, Q. -X. Dong, Y. -D. Zhang, G. Hou and X. -B. Wang, Analytic Calculation of Arbitrary Matrix Elements for Boson Exponential Quadratic Operator, Physical Review E 56, 2553 (1997). 13) J. -W. Pan, Y. -D. Zhang, and G. -G. Xiao, Exact Expressions of Energy Spectrum and Partition Function for Quantum Quadratic Systems, Chinese Physics Letters 14, 241 (1997). 14) D. Bouwmeester, J. -W. Pan, K. Mattle, H. Weinfurter, M. Zukowski, and A. Zeilinger, Experimental Quantum Teleportation of arbitrary quantum states, Applied Physics B 67, 749 (1998). 15) D. Bouwmeester, J. -W. Pan, M. Daniell, H. Weinfurter, M. Zukowski, and A. Zeilinger, Reply to '' A posteriori teleportation '', Nature 394, 841 (1998). 16) D. Bouwmeester, J. -W. Pan, K. Mattle, E. Eibl, H. Weinfurter, and A. Zeilinger, Experimental Quantum Teleportation, Philosophical Transactions of the Royal Society A, 356, 1733 (1998). 17) J. -W. Pan, D. Bouwmeester, H. Weinfurter, and A. Zeilinger, Experimental Entanglement Swapping: Entangling photons that never interacted, Physcial Review Letters 80, 3891 (1998). 18) J. -W. Pan, Y. -D. Zhang, and Q. -X. Dong, Comment on "On Quantum Zeno Effect", Physics Letters A 238, 405 (1998). 19) J. -W. Pan and A. Zeilinger, Greenberger- Horne-Zeilinger-state Analyzer, Physical Review A 57, 2208 (1998). 20) D. Bouwmeester, J. -W. Pan, M. Daniell, H. Weinfurter, and A. Zeilinger, Observation of Three-photon Greenberger-Horne-Zeilinger Entanglement, Physcial Review Letters 82, 1345 (1999). 21) J. -W. Pan, S. Yu, Y. -D. Zhang, and G. -G. Siu, Quantum Statistics for General Quadratic System,Communications in Theoretical Physics 31, 121 (1999). 22) D. Bouwmeester, J. -W. Pan, H. Weinfurter, and A. Zeilinger, High Fidelity Teleportation of Qubits,Journal of Modern Optics 47, 279 (2000). 23) H. -X. Lu, K. -J. Liu, J. -W. Pan, and Y. -D. Zhang, Energy spectrum and wave function for multi-mode coupled non-identical harmonic Oscillators, Chinese Physics Letters 9, 5 (2000). 24) J. -W. Pan, D. Bouwmeester, M. Daniell, H. Weinfurter, and A. Zeilinger, Experimental test of quantum nonlocality in three-Photon Greenberger-Horne-Zeilinger entanglement, Nature 403, 515 (2000). 25) J. -W. Pan, C. Simon, C. Brukner, and A. Zeilinger, Entanglement purification for quantum communication, Nature 410, 1067 (2001). 26) J. -W. Pan, M. Daniell, S. Gasparoni, G. Weihs, and A. Zeilinger, Experimental demonstration of four-photon entanglement and high-fidelity teleportation, Physical Review Letters 86, 4435 (2001). 27) Z. Zhao, J. -W. Pan, and M. -S. Zhan, A practical scheme for entanglement concentration, Physical Review A 64, 014301 (2001). 28) T. Jennewein, G. Weihs, J. -W. Pan, and A. Zeilinger, Experimental Nonlocality Proof of Quantum Teleportation and Entanglement Swapping, Physical Review Letters 88, 017903 (2002). 29) Z. -B. Chen, J. -W. Pan, G. Hou, and Y. - D. Zhang, Maximal Violation of Bell’s Inequalities for Continuous Variable Systems, Physical Review Letters 88, 040406 (2002). 30) C. Simon and J. -W. Pan, Polarization Entanglement Purification using Spatial Entanglement, Physical Review Letters 89, 257901 (2002). 31) C. Brukner, J. -W. Pan, C. Simon, G. Weihs, and A. Zeilinger, Probabilistic Instantaneous Quantum Computation, Physical Review A 67, 034304 (2003). 32) S. Yu, Z. -B. chen, J. -W. Pan, and Y.-D. Zhang, Classifying N-qubit Entanglement via Bell's Inequalities, Physical Review Letters 90, 080401 (2003). 33) J. -W. Pan, S. Gasparoni, M. Aspelmeyer, T. Jennwein, and A. Zeilinger, Experimental realization of freely propagating teleported qubits, Nature 421, 721 (2003). 34) Z. -B. Chen, J. -W. Pan, Y.-D. Zhang, C. Brukner, and A. Zeilinger, All-vesus-Nothing Violation of Local Realism for Two Entangled Photons, Physical Review Letters 90, 160408 (2003). 35) J. -F. Du, P. Zou, M. -J. Shi, L. C. Kwek, J. -W. Pan, C. H. Oh, A. Ekert, D. Oi, and M. Ericsson, Observation of mixed state geometric phases using NMR interfermetry, Physical Review Letters 91, 100403 (2003). 36) Z. Zhao, T. Yang, Y.-A. Chen, A.-N. Zhang, M. Zukowski, and J. -W. Pan, Experimental violation of local realism by four-photon Greenberger-Horne-Zeilinger entanglement, Physical Review Letters 91, 180401 (2003). 37) S.-X. Yu, J. -W. Pan, Z. -B. chen, and Y.-D. Zhang, effect Test of Entanglement for Two-level Systems, Physical Review Letters 91, 217903 (2003). 38) A. Vaziri, J. -W. Pan, T. Jennewein, G. Weihs, and A. Zeilinger, Experimental Concentration of High Dimensional Entanglement, Physical Review Letters 91, 227902 (2003). 39) C. Brukner, M. S. Kim, J. -W. Pan, and A. Zeilinger, Correspondence between Continuous Variable and Discrete Quantum Systems of Arbitrary Dimensions, Physical Review A68, 062105 (2003). 40) K. Sanaka, T. Jennewein, J. -W. Pan, K. Resch, and A. Zeilinger, Experimental non-linear sign shift for efficient quantum computation, Physical Review Letters 92, 017902 (2004). 41) L. Xiao, G.-L. Long, F.-G. Deng, and J. - W. Pan, Efficient multiparty quantum-secret-sharing schemes, Physical Review A69, 052307 (2004). C. Brukner, M. Zukowski, J. -W. Pan, and A. Zeilinger, Bell's inequality as a criterion for quantum communication complexity advantage, Physical Review Letters92, 127901 (2004). 42) W. Philip, J. -W. Pan, M. Aspelmayer, R. Ursin, S. Gasparoni, and A. Zeilinger, A four-photon Young’s double-slit experiment, Nature 429, 158 (2004). 43) Z. Zhao, Y.-A. Chen, A.-N. Zhang, T. Yang, H. Briegel, and J. -W. Pan, Experimental demonstration of five-photon entanglement and open-destination quantum teleportation, Nature 430, 54 (2004). Physical Review Letters 93, 020504 (2004). 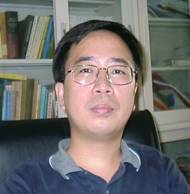 45) Z. Zhao, A.-N. Zhang, Y.-A. Chen, H. Zhang, J.-F. Du, T. Yang, and J. -W. Pan, Experimnetal demonstration of a nondestructive controlled-NOT quantum gate for two indepedent photon qubits, Physical Review Letters 94, 030501 (2005). 46) P. Wather, K. Resch, C. Brukner, A. Steinberg, J. -W. Pan, and A. Zeilinger, Quantum nonlocality obtained from local state by entanglement purification, Physical Review Letters 94, 040504 (2005). 47) C. -Z. Peng, T. Yang, X. -H. Bao, J. Zhang, X. -M. Jin, F. -Y. Feng, B. Yang, J. Yang, J. Yin, Q. Zhang, N. Li, B. -L. Tian, and J. -W. Pan, Experimental Free-Space Distribution of Entangled Photon Pairs Over 13 km: Towards Satellite-Based Global Quantum Communication, Physical Review Letters94, 150501 (2005). 48) Z. Zhao, A. -N. Zhang, X. -Q. Zhou, Y. -A. Chen, C. -Y. Lu, A. Karlsson, and J. -W. Pan, Experimental Realization of Optimal Asymmetric Cloning and Telecloning via Partial Teleportation, Physical Review Letters 95, 030502 (2005). 49) J. -R. Tian, Z. -Y. Wei, P. Wang, H. -N. Han, J. Zhang, L. -H. Zhao, Z. -H. Wang, J. Zhang, T. Yang, and J. -W. Pan, Independently tunable 1.3 W femtosecond Ti : sapphire lasers passively synchronized with attosecond timing jitter and ultrahigh robustness, Optics Letters 30, 2161 (2005). 50) Y. -A. Chen, A. -N. Zhang, Z. Zhao, X. -Q. Zhou, C. -Y. Lu, C. -Z. Peng, T. Yang, and J. -W. Pan, Experimental quantum secret sharing and third-man quantum cryptography, Physical Review Letters 95, 200502 (2005). 51) T. Yang, Q. Zhang, J. Zhang, J. Yin, Z. Zhao, M. Zukowski, Z. -B. Chen, and J. -W. Pan, All-versus-nothing violation of local realism by two-photon, four-dimensional entanglement, Physical Review Letters 95, 240406 (2005). 52) Q. Zhang, X. -B. Wang, Y. -A. Chen, W. -Y. Hwang, T. Yang, and J. -W. Pan, Comment on "Quantum key distribution with blind polarization bases", Physical Review Letters96, 078901 (2006). 53) A. -N. Zhang, C. -Y. Lu, X. -Q. Zhou, Y. -A. Chen, Z. Zhao, T. Yang, and J. -W. Pan, Experimental construction of optical multiqubit cluster states from Bell states, Physical Review A 73, 022330 (2006). 54) Q. Zhang, J. Yin, T. -Y. Chen, S. Lu, J. Zhang, X. -Q. Li, T. Yang, X. -B. Wang, and J. -W. Pan, Experimental fault-tolerant quantum cryptography in a decoherence-free subspace, Physical Review A 73, 020301 (2006). 55) T. Yang, Q. Zhang, T. -Y. Chen, S. Lu, J. Yin, J. -W. Pan, Z. -Y. Wei, J. -R. Tian, and J. Zhang, Experimental synchronization of independent entangled photon sources, Physical Review Letters96, 110501 (2006). 56) T. -Y. Chen, J. Zhang, J. Boileau, X. -M. Jin, B. Yang, Q. Zhang, T. Yang, R. Laflamme, and J. -W. Pan, Experimental quantum communication without a shared reference frame, Physical Review Letters 96, 150504 (2006). 57) Z. -B. Chen, Q. Zhang, X. -H. Bao, J. Schmiedmayer, and J. -W. Pan, Deterministic and efficient quantum cryptography based on Bell's theorem, Physical Review A 73, 050302 (R) (2006). 58) Y. -A. Chen, A. -N. Zhang, Z. Zhao, X. -Q. Zhou, and J. -W. Pan, Experimental quantum error rejection for quantum communication, Physical Review Letters96, 220504 (2006). 59) Q. Zhang, A. Goebel, C. Wagenknecht, Y. - A. Chen, B. Zhao, T. Yang, A. Mair, J. Schmiedmayer, and J. -W. Pan, Experimental quantum teleportation of a two-qubit composite system, Nature Physics 2, 678 (2006). 60) S. Chen, Y. -A. Chen, T. Strassel, Z. -S. Yuan, B. Zhao, J. Schmiedmayer, and J. -W. Pan, Deterministic and storable single-photon source based on a quantum memory, Physical Review Letters 97, 173004 (2006). 61) Y. -A. Chen, T. Yang, A. -N. Zhang, Z. Zhao, A. Cabello, and J. -W. Pan, Experimental violation of Bell's inequality beyond Tsirelson's bound, Physical Review Letters 97, 170408 (2006). 62) Z. -B. Chen, B. Zhao, Y. -A. Chen, J. Schmiedmayer, and J. -W. Pan, Fault-tolerant quantum repeater with atomic ensembles and linear optics, Physical Review A 76, 022329 (2007). 63) O. Gühne, C. -Y. Lu, W. -B. Gao, and J. -W. Pan, Toolbox for entanglement detection and fidelity estimation, Physical Review A 76, 030305 (2007). 64) J. Zhang, X. -H. Bao, T. -Y. Chen, T. Yang, A. Cabello, and J. -W. Pan, Experimental quantum “Guess my Number” protocol using multiphoton entanglement, Physical Review A 75, 022302 (2007). 65) S. Manz, T. Fernholz, J. Schmiedmayer, and J. -W. Pan, Collisional decoherence during writing and reading quantum states, Physical Review A 75, 040101 (2007). 66) B. Zhao, Z. -B. Chen, J. -W. Pan, J. Schmiedmayer, A. Recati, G. E. Astrakharchik, and T. Calarco, High- fidelity entanglement via molecular dissociation in integrated atom optics, Physical Review A 75, 042312 (2007). 67) L. -M. Kuang, Z. -B. Chen, and J. -W. Pan, Generation of entangled coherent states for distant Bose-Einstein condensates via electromagnetically induced transparency, Physical Review A 76, 052324 (2007). 68) X. -B. Wang, C. -Z. Peng, and J. -W. Pan, Simple protocol for secure decoy-state quantum key distribution with a loosely controlled source, Applied Physics Letters 90, 031110 (2007). 69) C. -Z. Peng, J. Zhang, D. Yang, W. -B. Gao, H. -X. Ma, H. Y., H. -P. Zeng, T. Yang, X. -B. Wang, and J. -W. Pan, Experimental Long-Distance Decoy-State Quantum Key Distribution Based on Polarization Encoding, Physical Review Letters 98, 010505 (2007). 70) X. -H. Bao, T. -Y. Chen, Q. Zhang, J. Yang, H. Zhang, T. Yang, and J. -W. Pan, Optical Nondestructive Controlled-NOT Gate without Using Entangled Photons, Physical Review Letters 98, 170502 (2007). 71) Z. -S. Yuan, Y. -A. Chen, S. Chen, B. Zhao, M. Koch, T. Strassel, Y. Zhao, G. -J. Zhu, J. Schmiedmayer, and J. -W. Pan, Synchronized Independent Narrow-Band Single Photons and Efficient Generation of Photonic Entanglement, Physical Review Letters 98, 180503 (2007). 72) B. Zhao, Z. -B. Chen, Y. -A. Chen, J. Schmiedmayer, and J. -W. Pan, Robust Creation of Entanglement between Remote Memory Qubits, Physical Review Letters 98, 240502 (2007). 73) K. Chen, C. -M. Li, Q. Zhang, Y. -A. Chen, A. Goebel, S. Chen, A. Mair, and J. -W. Pan, Experimental Realization of One-Way Quantum Computing with Two-Photon Four-Qubit Cluster States, Physical Review Letters 99,120503 (2007). 74) S. Chen, Y. -A. Chen, B. Zhao, Z. -S. Yuan, J. Schmiedmayer, and J. -W. Pan, Demonstration of a Stable Atom-Photon Entanglement Source for Quantum Repeaters, Physical Review Letters99, 180505 (2007). 75) C. -Y. Lu, D. E. Browne, T. Yang, and J. -W. Pan, Demonstration of a Compiled Version of Shor’s Quantum Factoring Algorithm Using Photonic Qubits, Physical Review Letters 99, 250504 (2007). 76) C. -Y. Lu, X. -Q. Zhou, O. Guhne, W. -B. Gao, J. Zhang, Z. -S. Yuan, A. Goebel, T. Yang, and J. -W. Pan, Experimental entanglement of six photons in graph states, Nature Physics 3, 91-95 (2007). 77) W. -B. Gao, X. -Q. Zhou, J. Zhang, T. Yang and J. -W. Pan, A proof-of-principle experiment of eliminating photon-loss errors in cluster states, New Journal of Physics 10, 055003 (2008). 78) X. -B. Wang, C. -Z. Peng, J. Zhang, L. Yang, and J. -W. Pan, General theory of decoy-state quantum cryptography with source errors, Physical Review A 77, 042311 (2008). 79) Q. Zhang, X. -H. Bao, C. -Y. Lu, X. -Q. Zhou, T. Yang, T. Rudolph, and J. -W. Pan, Demonstration of a scheme for the generation of “event-ready” entangled photon pairs from a single-photon source, Physical Review A 77, 062316 (2008). 80) X. -Q. Zhou, C. -Y. Lu, W. - B. Gao, J. Zhang, Z. -B. Chen, T. Yang, and J. -W. Pan, Greenberger- Horne-Zeilinger-type violation of local realism by mixed states, Physical Review A 78, 012112 (2008). 81) A. M. Goebel, C. Wagenknecht, Q. Zhang, Y. -A. Chen, K. Chen, J. Schmiedmayer, and J. -W. Pan, Multistage Entanglement Swapping, Physical Review Letters 101, 080403 (2008). 82) C. -S. Chuu, T. Strassel, B. Zhao, M. Koch, Y. -A. Chen, S. Chen, Z. -S. Yuan, J. Schmiedmayer, and J. -W. Pan, Quantum Memory with Optically Trapped Atoms, Physical Review Letters 101, 120501 (2008). 83) X. -H. Bao, Y. Qian, J. Yang, H. Zhang, Z. -B. Chen, T. Yang, and J. -W. Pan, Generation of Narrow-Band Polarization-Entangled Photon Pairs for Atomic Quantum Memories, Physical Review Letters 101, 190501 (2008). 84) W. -B. Gao, X. -Q. Zhou, J. Zhang, T. Yang, and J. -W. Pan, A proof-of-principle experiment of eliminating photon-loss errors in cluster states, New Journal of Physics 10, 055003 (2008). 85) C. -Y. Lu, W. -B. Gao, L. Zhang, X. -Q. Zhou, T. Yang and J. -W. Pan, Experimental quantum coding against qubit loss error, Proceedings of the National Academy of Sciences 105, 11050-11054 (2008). 86) Y. -A. Chen, S. Chen, Z. -S. Yuan, B. Zhao, C. -S. Chuu, J. Schmiedmayer, and J. -W. Pan, Memory-built-in quantum teleportation with photonic and atomic qubits, Nature Physics 4 103-107 (2008). 87) Z. -S. Yuan, Y. -A. Chen, B. Zhao, S. Chen, J. Schmiedmayer, and J. -W. Pan, Experimental demonstration of a BDCZ quantum repeater node, Nature 454 1098 (2008). 88) J. -G. Ren, B. Yang, Z. H. Yi, F. Zhou, K. Chen, C. -Z. Peng, and J. -W. Pan, Long-distance quantum teleportation assisted with free-space entanglement distribution, Chinese Physics B 18, 3605 (2009). 89) S. Jiang, X. -M. Luo, L. -Q. Chen, B. Ning, S. -A. Chen SA, J. -Y. Wang, Z. -P. Zhong, and J. -W. Pan, Observation of prolonged coherence time of the collective spin wave of an atomic ensemble in a paraffin-coated Rb-87 vapor cell, Physical Review A 80 , 062303 (2009). 90) J. Yang, X. -H. Bao, H. Zhang, S. Chen, C. -Z. Peng, Z. -B. Chen, and J. -W. Pan, Experimental quantum teleportation and multiphoton entanglement via interfering narrowband photon sources, Physical Review A 80, 042321 (2009). 91) X. -B. Wang, L. Yang, C. -Z. Peng, and J. -W. Pan, Decoy-state quantum key distribution with both source errors and statistical fluctuations, New Journal of Physics 11, 075006 (2009). 92) T. -Y. Chen, Y. Liu, W. -Q. Cai, L. Ju, H. Liang, W. -Y. Liu, J. Wang, H. Yin, K. Chen, Z. -B. Chen, C. -Z. Peng, and J. -W. Pan, Field test of a practical secure communication network with decoy-state quantum cryptography, Optics Express 17, 6540 (2009). 93) C. -Y. Lu, W. -B. Gao, O. Gühne, X. -Q. Zhou, Z. -B. Chen, andJ. -W. Pan, Demonstrating Anyonic Fractional Statistics with a Six-Qubit Quantum Simulator, Physical Review Letters 102, 030502 (2009). 94) C. -Y. Lu, T. Yang, and J. -W. Pan, Experimental Multiparticle Entanglement Swapping for Quantum Networking, Physical Review Letters 103, 020501 (2009). 95) B. Zhao, Y. -A. Chen, X. -H. Bao, T. Strassel, C. S. Chuu, X. -M. Jin, J. Schmiedmayer, Z. -S. Yuan, S. Chen, and J. -W. Pan, A millisecond quantum memory for scalable quantum networks, Nature Physics 5, 95 (2009). 96) R. Wei, B. Zhao, Y. Deng, S. Chen, Z. -B. Chen, and J. -W. Pan, Light pulse in Lambda-type cold-atom gases, Physical Review A 81, 043403 (2010). 97) W. -B. Gao, X. -C. Yao, P. Xu, H. Lu, O. Guhne, A. Cabello, C. -Y. Lu, T. Yang, Z. -B. Chen, and J. -W. Pan, Bell inequality tests of four-photon six-qubit graph states, Physical Review A 82, 042334 (2010). 98) Y. Liu, T. -Y. Chen, J. Wang, W. -Q. Cai, X. Wan, L. -K. Chen, J. -H. Wang, S. -B. Liu, H. Liang, L. Yang, C. - Z.Peng, K. Chen, Z. -B. Chen, J. -W. Pan, Decoy-state quantum key distribution with polarized photons over 200 km, Optics Express 18, 8587 (2010). 99) T. -Y. Chen, J. Wang, H. Liang, W. -Y. Liu, Y. Liu, X. Jiang, Y. Wang, X. Wan, W. -Q. Cai, L. Ju, L. -K. Chen, L. -J. Wang, Y. Gao, K. Chen, C. -Z. Peng, Z. -B. Chen and J. - W. Pan, Metropolitan all-pass and inter-city quantum communication network, Optics Express 18, 27217 (2010). 100) W. -B. Gao, P. Xu, X. -C. Yao, O. Gühne, A. Cabello, C. -Y. Lu, C. -Z. Peng, Z. -B. Chen, J. -W. Pan, Experimental Realization of a Controlled-NOT Gate with Four- Photon Six-Qubit Cluster States, Physical Review Letters 104, 020501 (2010). 101) Y. -A Chen, X. -H. Bao, Z. - S. Yuan, S. Chen, B. Zhao, and J. -W. Pan, Heralded Generation of an Atomic NOON State, Physical Review Letters 104, 043601 (2010). 102) B. Jungnitsch, S. Niekamp, M. Kleinmann, O. Gühne, H. Lu, W. -B. Gao, Y. -A. Chen, Z. -B. Chen, and J. -W. Pan, Increasing the Statistical Significance of Entanglement Detection in Experiments, Physical Review Letters 104, 210401 (2010). 103) X. -C. Yao, J. Fiurášek, H. Lu, W. -B. Gao, Y. -A Chen, Z. -B. Chen, and J. -W. Pan, Experimental Realization of Programmable Quantum Gate Array for Directly Probing Commutation Relations of Pauli Operators, Physical Review Letters 105, 120402 (2010). 104) C. -M. Li, K. Chen, A. Reingruber, Y. -N. Chen, and J. -W. Pan, Verifying Genuine High-Order Entanglement, Physical Review Letters 105, 210504 (2010). 105) W. -B. Gao, A. M. Goebel, C. -Y. Lu, H. - N. Dai, C. Wagenknecht Q. Zhang, B. Zhao, C. -Z. Peng, Z. -B. Chen, Y. -A. Chen, J. -W. Pan, Teleportation-based realization of an optical quantum two-qubit entangling gate, Proceedings of the National Academy of Sciences 107, 20869 (2010). 106) W. -B. Gao, C. -Y. Lu, X. -C. Yao, P. Xu, O. Gühne, A. Goebel, Y. -A. Chen, C. -Z. Peng, Z. -B. Chen and J. -W. Pan, Experimental demonstration of a hype-entangled ten-qubit Schrödinger cat state, Nature Physics 6, 331 (2010). 107) C. Wagenknecht, C. -M. Li, A. Reingruber, X. -H. Bao, A. Goebel, Y -A. Chen, Q. Zhang, K. Chen, and J. -W. Pan, Experimental Demonstration of a Heralded Entanglement Source, Nature Photonics 4, 549 (2010). 108) X. -M. Jin, J. -G. Ren, B. Yang, Z. -H. Yi, F. Zhou, X. -F. Xu, S. -K. Wang, D. Yang, Y. -F. Hu, S. Jiang, T. Yang, K. Chen, C. -Z. Peng and J. -W. Pan, Experimental Free-Space Quantum teleportation, Nature Photonics 4, 376 (2010). 109) Z. -S. Yuan, X. -H. Bao, C. -Y. Lu, J. Zhang, C. -Z. Peng, and J. -W. Pan, Entangled photons and quantum communication, Physics Reports 497, 1 (2010). 110) J. Yang , T. -M. Zhao, H. Zhang, T. Yang, X. -H. Bao, and J. -W. Pan, Realization of double resonance for a bright frequency-tunable source of narrowband entangled photons, Chinese Physics B 20, 024202 (2011). 111) W. -B. Gao, X. -C. Yao, J. -M. Cai, H. Lu, P. Xu, T. Yang, C. -Y. Lu, Y. -A. Chen, Z. -B. Chen and J. -W. Pan, Experimental measurement-based quantum computing beyond the cluster- state model, Nature Photonics 5, 117 (2011). 112) H. Zhang, X. –M. Jin, J. Yang, H. –N. Dai, S. –J. Yang, T. –M. Zhao, J. Rui, Y. He, X. Jiang, F. Yang, G. –S. Pan, Z. –S. Yuan, Y. Deng, Z. –B. Chen, X. –H. Bao, S. Chen, B. Zhao & J. –W. Pan, Preparation and storage of frequency- uncorrelated entangled photons from cavity-enhanced spontaneous parametric downconversion, Nature Photonics 5, 628 (2011). 113) X. –C. Yao, T. –X. Wang, P. Xu, H. Lu, G. –S. Pan, X. –H. Bao, C. –Z. Peng, C. –Y. Lu, Y. –A. Chen and J. –W. Pan, Observation of eight-photon entanglement, accepted by Nature Photonics (2011). 115) J. -W. Pan, Z. -B. Chen, M. Zukowski, H. Weinfurter and A. Zeilinger, Multi-photon entanglement and interferometry (arXiv:0805.2853), Reviews of Modern Physics (2011), in press.